The Montana Disability and Health Program (MTDH) in partnership with the Rural Institute on Inclusive Communities and the National Center on Health, Physical Activity and Disability will be holding an Inclusive Fitness Training Workshop in Missoula on May 15-16, 2019. 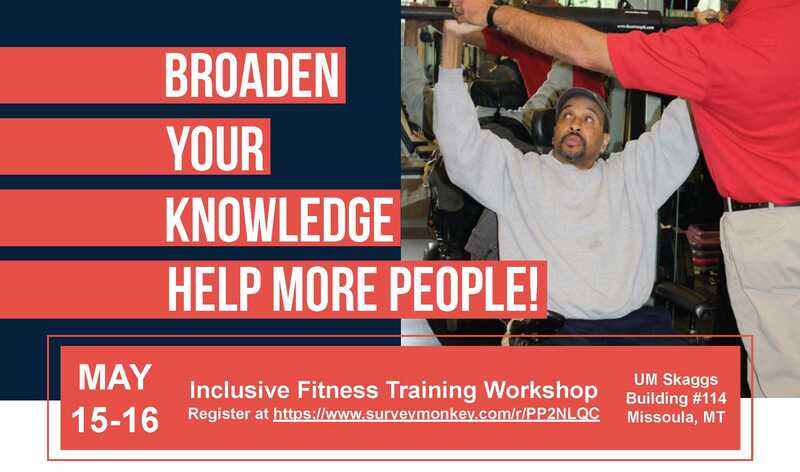 This workshop is a great opportunity to learn about inclusivity, exercise recommendations, adaptations, and much more. We’re all human, but we’re not all the same. Financial help available for most people to get health insurance. Go to www.healthcare.gov today and #GetCovered. The New Hampshire Disability and Public Health Project has created an online, on-demand, free training for mammography technologists. The training is eligible for 1 Category A credit from the American Registry of Radiologic Technologists. Click on the following link to register: Responsive Practice: Providing Mammography to Women with Disabilities. For questions, please contact Sara Rainer at the contact information below. Community health needs assessments (CHA) allow community agencies and service providers to discuss issues. However, this process lacked representation from people that utilize community services and experience health inequities. Staff were successful in applying an inclusive approach to engage residents and organizations that represented low-income and minority populations through CHA workgroup meetings, surveys and interviews. During the previous 2014 CHA, the Missoula City-County Health Department (MCCHD) Leadership Team conducted a survey with past CHA participants to identify areas for improvement.